Rossco McElhaney, a 7-year-old MN Miniature Pincher was found in a culvert at a DFW water treatment plant. It is unknown for how long Rossco was trapped in the culvert. Mrs. McElhaney kindly rescued Rossco from the culvert, and presented him to her rDVM with a body condition score of 1/9 (emaciated with obvious loss of muscle mass), 6% dehydration (definite delay in return of skin to normal position, increase in capillary refill time, and eyes slightly sunken into orbits), patchy alopecia (hair loss) only on legs, with remaining hairs dry, brittle and easy to epilate (remove), superficial lacerations on the legs, and very dry scaly skin. He received treatment for a superficial bacterial infection, Vitamin B12 injection, VitaPlex daily, and subcutaneous fluids twice daily for several days. 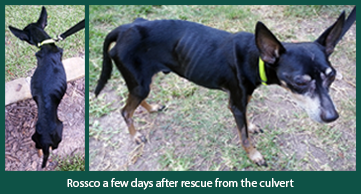 In addition, Rossco received a high-quality dog food twice to three times daily. The blood work revealed a mild anemia (low red blood cell count), very low phosphorus (poor nutrition), low normal calcium (poor nutrition), low normal albumin (poor nutrition), low normal bile acids (poor nutrition), elevated ALT (poor nutrition), and ALKP (stress and poor nutrition). A recheck revealed good hydration and a healthy appetite. However, the patchy alopecia (hair loss) continued to worsen now affecting the top of the head, ear flaps, ear margins, the entire chest, the shoulders, and back. In addition, erosive paw pad changes were seen affecting almost all the paw pads. Due to the severity of hair loss and cutaneous changes, he was referred to the Animal Dermatology Referral Clinic for an urgent consult. The dermatology exam revealed: BCS 2/9 (emaciated with minimal loss of muscle mass), good hydration, few resolving epidermal collarettes, worsening of patchy hair loss with remaining hairs very dry and brittle to the touch, dry skin, erosive lesions noted on the ear margins and every paw pad. Skin cytology from the epidermal collarettes revealed several clusters of neutrophils with intracellular/extracellular cocci. Trichogram (plucked hairs) revealed all plucked hairs were in the telogen stage (resting stage) of the hair growth cycle. A DTM (ringworm) culture was collected and results were pending. The changes on the ear margins and all the paw pads were consistent with an ischemic dermatopathy (a syndrome that results from loss of blood supply from either vasculitis or vasculopathy). The antibiotic was continued another 3 weeks (for the resolving superficial bacterial infection), pentoxifylline was initiated for the ischemic dermatopathy (to help decrease suspect vascular inflammation and to increase blood flow to the distal capillaries in the ear tips/margins and paw pads). The balanced good nutritional diet was continued 2 to 3 times daily until the next recheck. After a few weeks, the DTM culture isolated Trichophyton sp. (ringworm) and terbinafine was initiated daily along with other medications pending a monthly recheck. So far, the diagnoses included: Severe emaciation, telogen effluvium (hair cycle arrest), ischemic dermatopathy, dermatophytosis (ring worm), and superficial pyoderma. 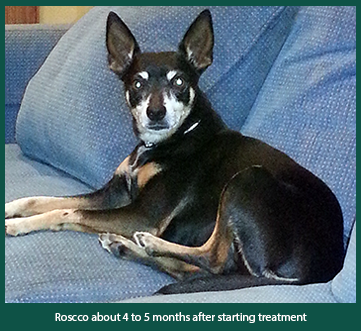 A few months after the initial presentation, Rossco’s body condition score was increasing now closer to 4/10. The hair loss was no longer worsening, but rather few new hairs were noted on all areas of the body. In addition, the pyoderma had resolved and the ischemic dermatopathy syndrome was resolving on the ear margins and paw pads. The pentoxifylline with the terbinafine were continued until the next recheck. 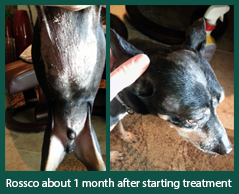 After 3 to 4 months of therapy and good nutrition, Rossco had reached a more normal body condition score ranked a 5/10, the clinical signs associated with ischemic dermatopathy had resolved, and more hair growth was noted. Only a few patchy areas of hair loss remained. The pentoxifylline was discontinued; however, the terbinafine was continued once daily until two negative cultures were confirmed. Rossco’s case was complicated because many things were going on at the same time. However, the majority of his aliments related to starvation. Starvation can cause severe stress on the body resulting in hair loss, infection, increased liver enzymes, and anemia. The body protects itself during the state of starvation by shifting precious proteins and other nutrients from less important structures such as hair and skin to life sustaining organs (brain, heart, liver, etc.). Research has shown that each hair is made up of 65% to 90% protein. In the face of protein deficiency the hair coat becomes dry, dull, brittle, and thin. Stressful circumstances such as high fever, pregnancy, shock, starvation, surgery, etc. can cause telogen effluvium. Telogen effluvium abruptly stops the normal hair growth cycle of hairs causing these hairs to remain in telogen and eventually shed. The hairs tend to fall out 1 to 3 months after removing the stressful insult. 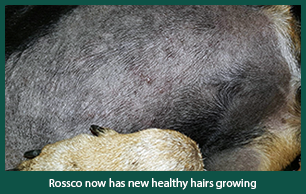 In Rossco’s case, hair loss greatly worsened about a month after starting the high-quality diet. The liver in the face of starvation has been shown to decrease complement production. Complement serves as a constant non-specific immune defense against bacteria, viruses, fungi, and parasites. The decrease of complement can results in a compromised immune system. In Rossco’s case, complement levels were not monitored; however, increased liver enzymes were noted when he was initially evaluated. Also, superficial infections (bacterial and dermatophyte) were present most likely due to an assumed decreased in complement production. The ischemic dermatopathy may or may not have been related to the anorexia. There is a long list of causes for ischemic dermatopathy syndrome: septic vasculitis, vector-borne infections, vaccine induced, etc. Rossco’s history remains unknown before he was found in the deep culvert as far as suspect cause of the ischemic dermatopathy. However, the clinical changes on the ear tips and paw pads responded well to oral antibiotics and pentoxifylline. Roscco continues to do well with his new found family.